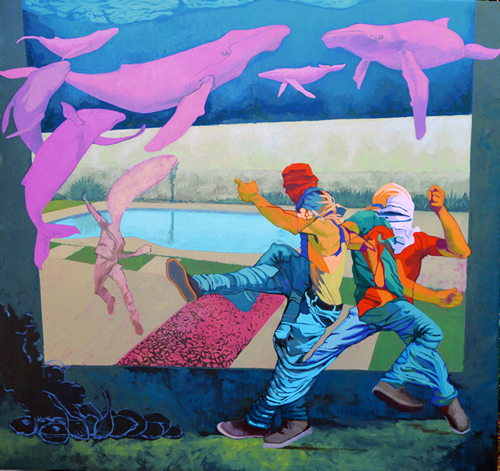 Large-scale oil paintings by Springfield artist Andrae Green, May 2nd to June 1st. Backscatter is a diffuse reflection due to scattering, as opposed to specular reflection as from a mirror. Andrae's work uses painting as an exploration to delve into the unquantifiable internalized senses which we use to perceive the world: intuition, clairvoyance, and other feelings that lie outside the physical realm. Fragility and impermanence are a constant in three-dimensional reality, and these works show those very slippages that occur due to interruptions by the metaphysical world. This speaks to our current age, where representation and reality can be interchangeable and physicality can be fleeting. History and fantasy can also be interchangeable and used to reinvent our identities. Andrae is particularly interested in how legacies of the Middle Passage and slavery can be re-imagined to fantasize alternate dimensions and multiple storylines that may not be in history books. Opening Reception: Thursday, May 2nd, 5-8pm, during Amherst Arts Night Plus. Andrae is a painter whose work explores the nuances of the collective consciousness that has been shaped by time, the sea, and the Middle Passage. Green was born in Kingston, Jamaica. In 2006, he was awarded a grant sponsored by the Jamaican government and the Chase Fund to obtain his MFA in Painting at the New York Academy of Art. In 2011, he was awarded a residency at the CAC Troy, NY. In 2012, he was one of two artists chosen to represent Jamaica in the Beijing Biennale. In 2013, 2015, and 2017, Green was selected as a part of the American delegation that represented the US at the Salon de Société Nationale des Beaux-Arts, at the Carrousel du Louvre in Paris, France. His paintings have been shown in the US, Jamaica, Canada, China, and France, and are in private collections around the world. He lives and works in Springfield with his wife, artist Priya Nadkarni.